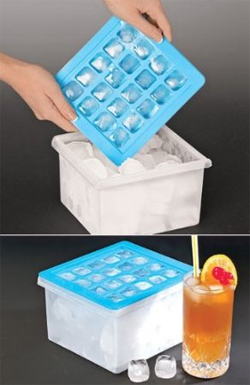 The space underneath the ice cube tray can finally be put to some good use. It may not amount to much (or really anything), but those that appreciate nice clean lines outside their freezer as well as on the inside can finally relax. The Ice Cube Tray With Storage Container Bin by MTR INC takes a no-nonsense approach to maximum space utilization by incorporating a storage container directly underneath the ice tray. Of course, using this freezer contraption might lead one to think about how to maximize storage space inside the container. Good thing then, that there is nothing that says one cannot fill up the bin to make one giant ice cube with funny dimples on top. But then what to put in all of those dimples?